Strawberries: No one can eat just one! Let’s get to know it better. In the 14th century, the French become the most fanatical strawberry fans, though it will take another 100 years until the happy marriage of strawberry and whipped cream. And this match only happened thanks to the English. Nevertheless, the cultivated strawberry as we know and enjoy today dates from 19th century. It may sound incredible, but there are more than 600 varieties that have a different flavour (! ), size and texture. But all varieties are just as beneficial with high vitamin content. 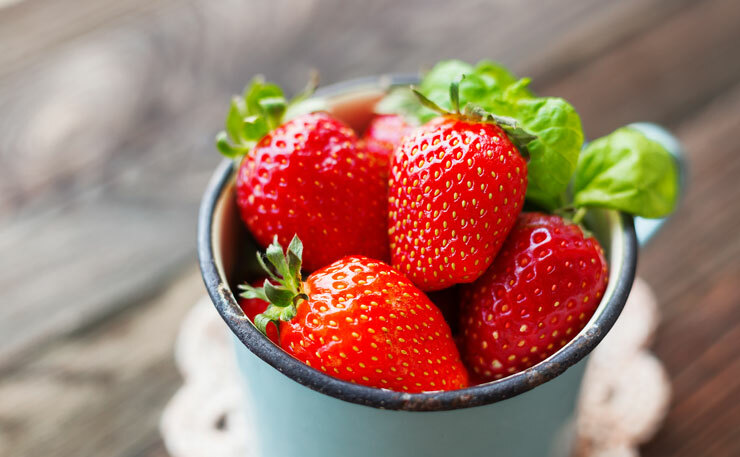 Even medicinal and cosmetic properties have been attributed to strawberries. When buying strawberries, the first thing to notice is their colour. Your strawberries must be bright red, their caps and stems green and fresh. They better be shiny and clean. In general, opt for small or regular sized ones, with a tight flesh. Strawberries are preserved in the refrigerator. But you should not wash them nor remove their stem before putting them in the fridge and in any case you should consume them within two to three days maximum. You can enjoy strawberries in many different ways. Although nothing can compare to a fresh strawberry dipped in chocolate, let’s look at some suggestions. Your diet and appetite permitting, you may add sugar or some Pomegranate Balsamic Cream and, of course, whipped cream. A timeless value! Of course, you can raise the experience to a higher level by dipping your strawberries in milk chocolate mixed with a little brandy or some Fig Balsamic Cream. Generally, you can add them to desserts like tarts, cheesecakes, panacotta, sponge or cream cakes. Strawberries can also be made into amazing jam, stewed fruit or liqueur. They are also an ingredient for the finest smoothies and the most special cocktails. In fact, if you choose to enjoy a sparkling cocktail, you can add a touch of Honey Balsamic Vinegar and feel the flavour taking off to a new dimension. Strawberries are also transformed into excellent ice cream; when garnished with Fig Balsamic Cream, it becomes truly addictive! Strawberry ice-cream also happens to be the children’s favourite – and children should know! Finally, you can add strawberries to your spring green salads. They combine wonderfully with rocket and of course with Classic Balsamic Vinegar Kalamata Papadimitriou, the No1 balsamic vinegar in Greece! Strawberries are a very good nutritional choice with few calories and a lot of flavour! They will add color to your life, not to mention plenty of vitamin C!